The group of about 10 professionals — engineers, nurses, and teachers — began meeting in the basement of a member's home. As their numbers grew, they moved to a local church. In an effort to raise public awareness about the risks of hydraulic fracturing (or “fracking”) they attended township meetings, zoning and ordinance hearings, and gas-drilling forums. They invited speakers from other states affected by gas drilling to talk with Pennsylvania residents. They held house-party style screenings of documentary films. The tri-weekly bulletins featured a wide range of supposed threats to the state's infrastructure. It included warnings about Al-Qaeda affiliated groups, pro-life activists, and Tea Party protesters. The bulletins also included information about when and where groups like GDAC would be meeting, upcoming protests, and anti-fracking activists' internal strategy. The raw data was followed by a threat assessment — low, moderate, severe, or critical — and a brief analysis. For example, bulletin no. 118, dated July 30, 2010 gave a low to moderate threat rating in reference to public meetings that anti-drilling activists planned to attend, and suggested that an “attack is likely… and might well be executed.” The threat assessment was accompanied by this note: “The escalating conflict over natural gas drilling in Pennsylvania may define local fault lines and potentially increase area environmentalist activity or eco-terrorism. GDAC communications have cited Northeastern Pennsylvania counties, specifically Wyoming, Lackawanna and Luzerne, as being in real 'need of our help' and as facing a 'drastic situation. '” Another bulletin referenced an August 2010 FBI assessment of the growing threat of environmental activism to the energy industry. Because of Pennsylvania's importance in the production of natural gas, ITRR concluded, an uptick in vandalism, criminal activity, and extremism was likely. By 2007, 70 percent of the US intelligence budget — or about $38 billion annually — was spent on private contractors. Much of this largesse has been directed toward overseas operations. But it is likely that some of that money has been paid to private contractors — hired either by corporations or law enforcement agencies — that are also in the business of spying on American citizens. As early as 2004, in a report titled “The Surveillance Industrial Complex,” the American Civil Liberties Union warned that the “US security establishment is making a systematic effort to extend its surveillance capacity by pressing the private sector into service to report on the activities of Americans.” At the same time, corporations are boosting their own security operations. Today, overall annual spending on corporate security and intelligence is roughly $100 billion, double what it was a decade ago, according to Brian Ruttenbur, a defense analyst with CRT Capital. The surveillance of even moderate groups like GDAC comes at a pivotal time for the environmental movement. As greenhouse gas emissions continue unchecked, opposition to the fossil fuel industry has taken on a more urgent and confrontational tone. Some anti-fracking activists have engaged in nonviolent civil disobedience and the protests against the Keystone XL tar sands pipeline have involved arrests at the White House. Environmentalists and civil libertarians worry that accusations of terrorism, even if completely unfounded, could undermine peaceful political protest. The mere possibility of surveillance could handicap environmental groups' ability to achieve their political goals. “You are painting the political opposition as supporters of terrorism to discredit them and cripple their ability to remain politically viable,” says Mike German, an FBI special agent for 16 years who now works with the ACLU. About a month after he was approached by the FBI, Briggle received a notice from his employer, the University of North Texas, asking him to turn over all emails and other written correspondence “pursuant to City of Denton natural gas drilling ordinances and the 'Denton Stakeholder Drilling Advisory Group,'” an organization Briggle founded in July 2011 whose mission is similar to that of GDAC. The university had received a request under the state's Public Information Act and Briggle was forced to hand over more than 1,300 emails. He was later told that the request had been made by Peggy Venable, Texas Director of Americans for Prosperity. More recently, according to a report in The Nation , the agricultural giant Monsanto contracted with a subsidiary of Blackwater, the private security firm, to gather intelligence on and possibly infiltrate environmental groups in order to protect the company's brand name. “This is the new normal,” says Scott Crow, an author and longtime environmental activist who was the subject of FBI and corporate surveillance for close to eight years beginning in 1999. While the above cases involved corporations hiring private security firms to carry out black-ops against environmental groups, the Pennsylvania scandal may be the first time that a state agency has contracted with a private security firm to gather intelligence on lawful groups for the benefit of a specific industry. Although the ITRR bulletins were produced for the Pennsylvania Department of Homeland Security, they were shared with PR firms, the major Marcellus Shale companies, and industry associations. For members of GDAC and other anti-drilling organizations, the revelations were profoundly troubling. Not only were they being lumped together with groups like Al-Qaeda, but the government agencies tasked with protecting the people of Pennsylvania were, in their view, essentially working for the gas companies. If a moderate group like GDAC wasn't safe from the surveillance-industrial complex, it seemed nobody was. “These systems and this type of collection is so rife with inappropriate speculation and error — both intentional and unintentional — that your good behavior doesn't protect you,” German says. This is only partially true. A list of the individuals and groups who received the bulletins shows that industry associations and PR firms that have nothing to do with protecting the state's infrastructure were also included. For example, one of Powers's key contacts on Marcellus-related activity was Pam Witmer, then head of the Bravo Group's energy and environmental practice as well as president and CEO of the Pennsylvania Chemical Industry Council, a business advocacy group. The Bravo Group is a public relations and lobbying firm based in Pennsylvania. Its clients include Chief Oil and Gas, Southwestern Energy, and People's Natural Gas, all of which are deeply invested in Marcellus Shale production. The anti-drilling movement is an “insurgency,” a PR specialist with Anadarko Petroleum says. The Marcellus Shale Coalition, an industry lobbying group, was also on the distribution list. In 2010 the coalition signed a $900,000 lobbying contract with Ridge Global, a private security firm founded by Tom Ridge, former head of the Department of Homeland Security under George W. Bush. As part of its energy consulting services Ridge Global offers “advisory support for natural gas and other infrastructure security.” Ridge is just one of many former security officials who now have private consulting services. Others include John Ashcroft, Michael Chertoff, and Richard Clarke. This is a global phenomenon. Corporations in Europe and Canada have also spied on environmental groups. In 2006 French energy giant EDF, the world's largest operator of nuclear reactors, hired Kargus Consultants, a private intelligence gathering agency run by a former member of the French secret service, to spy on Greenpeace. Kargus hacked into a lead Greenpeace organizer's computer and compiled a dossier on the organization's European campaign strategy. In 2011 a French court fined EDF 1.5 million euros and sent two of its employees to jail on charges of illegal spying. Although it was not raised at the Pennsylvania Senate hearing, the ITRR bulletins also were shared with the Royal Canadian Mounted Police (RCMP). In January a Montreal paper reported that the RCMP itself has been tracking anti-shale gas activists in Quebec. The Critical Infrastructure Intelligence Team, a branch of the RCMP, produced two reports that described the possibility of Canadian activists collaborating with “extremist” groups in the US, such as Earth First! and Occupy Well Street — an offshoot of Occupy Wall Street opposed to fracking. According to Jeff Monaghan, a researcher with the Surveillance Studies Center at Queen's University in Ontario, the Canadian government likely shares intelligence with the energy industry. Since at least 2005 the Canadian government has held biannual intelligence briefings to share sensitive information with the private sector. In 2007 Gary Lunn, former Minister of Natural Resources, admitted his agency had helped more than 200 industry representatives obtain high-level security clearances. “This enables us to share information with industry and their associations,” Lunn said at a pipeline security forum. 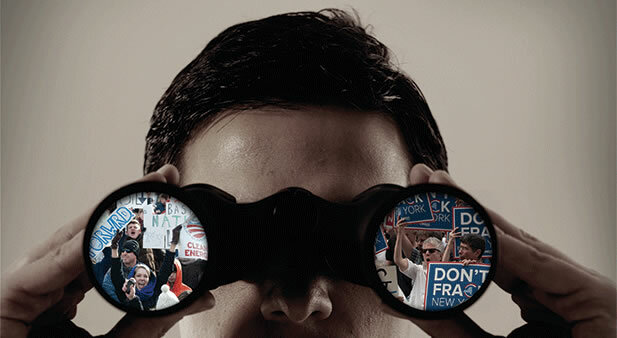 The fossil fuel industry's targeting of its critics goes beyond mere surveillance. Natural gas drilling companies have also flirted with using the dark arts of psychological warfare, or “psy ops.” In comments recorded by an anti-drilling activist at a 2011 natural gas conference in Houston and leaked to CNBC, Matt Pitzarella, director of corporate communications at Range Resources, said Range had hired “several former psy ops folks” with experience in Iraq and Afghanistan. “Having that understanding of psy ops in the Army and in the Middle East has applied very helpfully here for us in Pennsylvania [sic],” Pitzarella said. At the same conference, Matt Carmichael, a PR specialist with Anadarko Petroleum, referred to the anti-drilling movement as an “insurgency” and advised industry representatives to download the US Army/Marine Corps Counterinsurgency Manual. “There's a lot of good lessons in there and coming from a military background, I found the insight in that extremely remarkable,” he told his colleagues. The US Army Counterinsurgency Manual that was offered as suggested reading for shale gas industry representatives includes an appendix on Social Network Analysis, defined as “a tool for understanding the organizational dynamics of an insurgency.” In an age of digital networks and online activism, this often means using data-mining software, cyber surveillance, and in some cases outright computer hacking to track opposition groups. Corporations have already taken advantage of network forensic software to keep tabs on their own employees. The new technology, which allows companies to monitor an employee's activity down to the keystroke, is one of the fastest growing software markets. There is a fine line, however, between data mining — which is perfectly legal though largely out of view — and cyber surveillance, or hacking. While it is difficult to prove hacking, many activists are convinced their computers have been tampered with. Kari Matsko, a professional software consultant and director of the People's Oil and Gas Collaborative in Ohio, says her computer was hacked after she began to push for tougher regulation of the natural gas industry. Because of her profession Matsko has very strong computer security and says that prior to working on oil and gas issues she had never had problems with malware. But while assisting with the lawsuit Matsko's computer was attacked by a sophisticated virus. Matsko was able to remove it and everything seemed fine. About a month later, though, she unsuccessfully tried to open the computer folder that contained the sensitive files related to the lawsuit. The files were either missing or corrupted. “I remember I was so terrified by it that I didn't even tell people unless it was in person,” she says. John Trolla, a 61-year-old musician and guitar instructor whose communications were also featured in the ITRR bulletins, has been an outspoken critic of shale gas development for several years. In 2007 Chief Oil and Gas offered him a signing bonus of $1,400 to lease his mineral rights. Trolla, who lives in a modest two-story home in northeastern Pennsylvania, refused. He's been fighting the industry ever since. Even as corporations expand their surveillance of citizen-activists, they are seeking to obstruct public oversight of their own behavior. It's a bit like a one-way mirror of democratic transparency — with corporations and law enforcement on one side looking in and activists on the other. Pennsylvania is a case in point. In early 2012 legislators there passed “Act 13,” a set of amendments to the state's Oil and Gas Act, which essentially stripped local municipalities of the authority to regulate drilling activity through zoning ordinances and other measures. The law also requires doctors who treat patients exposed to fracking chemicals to sign a confidentially agreement before receiving information about the substances. The gag rule would prevent them from sharing that information with the patient or even other doctors (GDAC's current president, Dr. Alfonso Rodriguez, is challenging this provision). Earlier this year, a bill was introduced into the Pennsylvania legislature that would make it a felony to videotape farming operations in Pennsylvania — so-called “ag-gag” legislation that has already passed in Utah and Iowa, and has been introduced in several other legislatures. Many of the ag-gag bills draw on language crafted by the American Legislative Exchange Council's (ALEC) “Animal and Ecological Terrorism Act.” (In recent years ALEC has received considerable support from the natural gas industry). Section D of the ALEC bill defines an animal or ecological terrorist organization in broad terms “as any association, organization, entity, coalition, or combination of two or more persons” who seek to “obstruct, impede or deter any person from participating” not only in agricultural activity but also mining, foresting, harvesting, and gathering or processing of natural resources. “It's clearly legislation that could be easily expanded in any particular case to include folks like me who do whatever we can to get as close to some of these sites as we are able,” says Wendy Lee, a philosophy professor at Bloomsburg University who regularly photographs the industrial impacts of gas drilling and then posts them on her Flickr page. This article was produced in partnership with The Investigative Fund at The Nation Institute, now known as Type Investigations, with support from The Puffin Foundation.